An update: Here’s another (unnumbered) volume in the Albany Records series featuring George Walker‘s music. 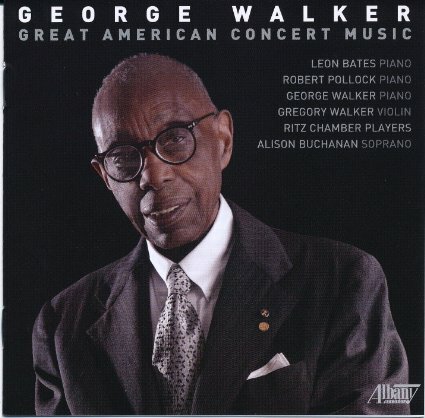 (The label also has a series focusing on Mr. Walker as pianist. Highlights are Music for 3 (1971) and his Piano Sonatas No. 3 (1976) and No. 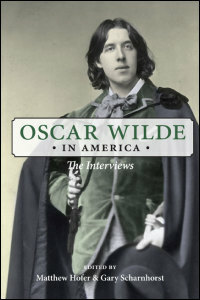 5 (2003), along with several songs to the poetry of Emily Dickinson, Paul Lawrence Dunbar, Robert Burns, and others. Albany Records has added a fourth volume to its laudable series of recordings of music by George Theophilus Walker. At 92 (going on 93), Mr. Walker remains an active composer and was recently nominated for New Jersey’s Hall of fame — he resides in Montclair — and if he wins, it would make a lovely addition to his accolades. They just happen to include a slew of honorary doctorates, AASCAP’s Aaron Copland Award, induction into the American Classical Music Hall of Fame … oh, and a Pulitzer, which he received in 1996 for his Whitman-inspired Lilacs. 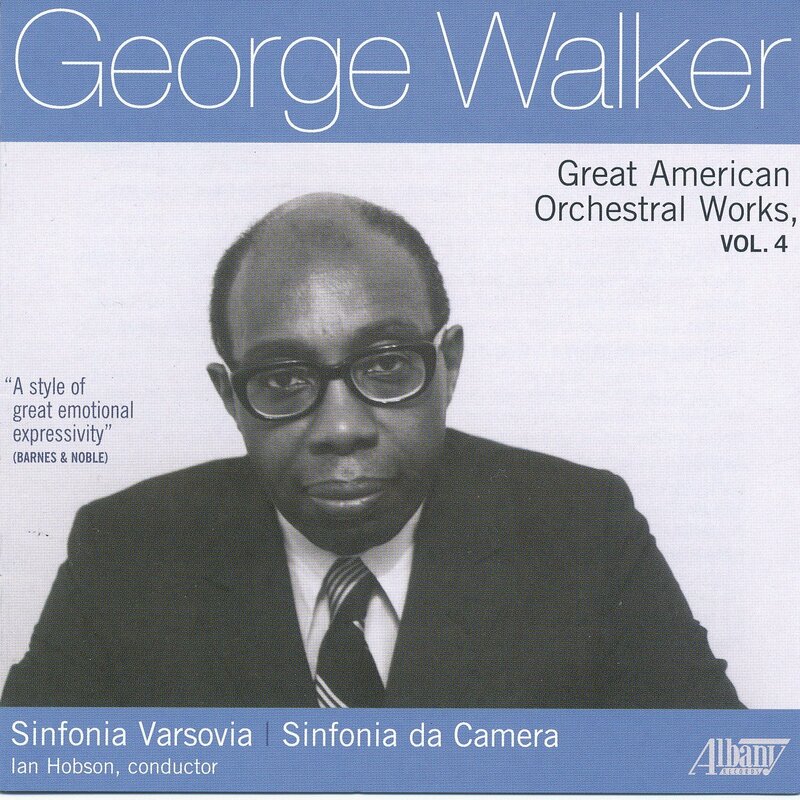 These are sensitive but rigorous performances and give a wonderful spread of Mr. Walker’s career, from Antifonys for String Orchestra (love the title), originally composed in 1967 for double string quartet, and the Pulitzer-winning Lilacs for Voice and Orchestra to several compositions that prove Mr. Walker’s creative energy has not dimmed. I’m especially attracted to the 2012 work Sinfonia No. 4 (“Strands”), which I recently heard as part of the National Symphony’s innovative New Moves series. (My notes on the piece are here.) To be honest, the account on this CD is a good deal richer and more compellingly shaped than what I heard in the live performance. Conductor Ian Hobson, leading Poland’s Sinfonia Varsovia, not only gets the solemnity and idea-dense intricacy of this music but knows how to articulate its drama, its transitional energy. Mr. Walker explains that the guiding idea behind the title “Strands” involves an “interplay” of thematic material that’s both severely compact and, with the subtle introduction of two quotations from spirituals, visionary and affirming. Given the task of writing a short “concert opener” with this commission, he chose a complex, densely argued soundscape over an easy crowd-pleasing rouser. It’s powerful stuff. On this recording Albert Rudolph Lee provides the originally intended tenor solo, singing this demanding, high-lying part with emotional fervor and conviction. As for the “eight minutes” originally stipulated by the commission, we’re fortunate that Mr. Walker followed his muse and composed a characteristically eloquent piece of 14 minutes (divided into four sections), the whole packed with gripping ideas and fragrant sound colors. Further evidence of Mr. Walker’s phenomenal creative drive at an advanced age is found in Movements for Cello and Orchestra, another product of his 90th year (2012). Dmitry Kousov is the splendid protagonist in this inventive rethinking of the cello concerto format. For more information on this American treasure, Ethan Iverson has conducted an interview at dothemath. (c) 2014 Thomas May – All rights reserved. My latest article for Listen magazine has now been published. The inspiring players of Carnegie Hall’s National Youth Orchestra debunk the myth of the ‘death’ of classical music. indignant but thoughtful counterarguments in response. What tends to become the focus of such discussions tends to be the problem of aging audiences and how to attract a new fan base, as well as how to reinvigorate the repertoire and make it meaningful for twenty-first century listeners. But a third — neglected — element is just as vitally important: the perspective of the musicians who bring it all to life in real time. What’s being done to ensure that this side of “the holy triangle of composer, performer, and listener” (to borrow Benjamin Britten’s phrase) is aligned with whatever reforms are undertaken regarding the other two? On the American scene, one of the most inspiring recent initiatives to cultivate young talent begins its second year this summer. 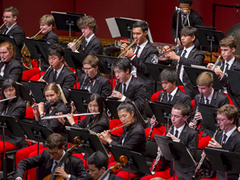 The National Youth Orchestra of the United States of America (NYO) was launched by Carnegie Hall’s Weill Music Institute last year, when the ensemble’s young members gathered from around the country at the beginning of July to prepare for a series of concerts that culminated in a tour to Russia and the London Proms. The same structure — a period of rehearsal and intensive preparation leading up to a high-adrenaline period of performances on the road — is being used this year. —El Maestro Farinelli with countertenor Bejun Mehta and Pablo Heras-Casado conducting the Concerto Köln. I have yet to hear anything routine from the amazing Spanish conductor. These performances of music by little-heard Baroque opera composers (including Porpora, Hasse, de Nebra, Jomelli, Corradini, Marcolini, and Traetta; there’s also a C.P.E. Bach Sinfonia title “Fandango”) show off the many-faceted Maestro Heras-Casado’s early-music expertise. Mehta sings only two numbers (one a brief zarzuela duet with a decidedly non-“HIP” overdubbing of his voice for both parts) but channels all the mystery and charisma of an 18th-century Klaus Nomi for the compelling Porpora aria (“Alto Giove, è tua grazia,” from Polifemo). I wish there were more vocal music here. Is it possible to be touched by a sense of the miraculous today? In our guarded, cynical age, can we feel anything remotely similar to the experience of wonder that was the norm rather than the exception for most of human history? Just before the turn of the millennium, John Adams began a risky new project to explore art’s power to re-enchant us. El Niño is the intensely beautiful and moving result. It’s a work that offers an unforgettable entrée into his musical world — and one that tends to keep a high position on the favorites list of the composer’s most ardent fans. For example, the 20th-century feminist novelist and poet Rosario Castellanos (1925-1974), who came of age in the mountainous country in the south of Mexico, provides the textual source for some of the most psychologically pivotal moments in El Niño. One of these is her poem “Memorial de Tlatelco,” about the killing of hundreds of students by police during a heated political protest in Mexico City in 1968. Adams sets this as the dramatic climax of the second part. This soprano aria forms the dark heart of El Niño, the violent negation of all the hope encompassed by the imagery of birth. 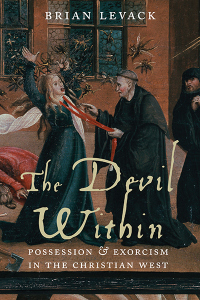 “Castellanos brings a grittiness and reality to this story, along with a sense of skepticism, that make the hopefulness the piece attains again have all the more meaning,” says Miller. The prevalence of non-scriptural Spanish sources represents a key to Adams’s vision in El Niño. Working with his longtime artistic collaborator and friend, the director Peter Sellars (to whom El Niño is dedicated), Adams crafted a libretto from pre-existing sources. Together they worked out a schema to interweave the well-known “plot points” as depicted in the New Testament — the Annunciation and mystery of the virgin birth, Mary’s visitation with her cousin Elisabeth, the humble surroundings of the birth itself, the homage of the Three Wise Men, Herod’s massacre of the innocents, and the flight into Egypt — with folk-like tales from the apocryphal gospels and poetry spanning from the Middle Ages to the 20th century — much of it by Latin American women poets. By interpolating the voices of these women, Adams and Sellars wanted to add a fresh perspective to the conventional account of the nativity. A retelling of that specific narrative, Adams realized, could simultaneously serve as the basis for far-ranging meditations on the miraculous reality of birth in general. Mary’s experience of pregnancy in El Niño represents the pregnancy of women across time, much as the birth of Jesus figures the birth of all children. An attempt to rekindle the sense of the miraculousness that fuels this story inspired the choices made by Peter Sellars for his inaugural staging of El Niño (which received its world premiere in Paris in December 2000). Sellars’s central concept was to emphasize the everydayness of the characters; their story unfolds in tandem with an accompanying silent film in which Latino actors from Los Angeles re-enacted a contemporary allegory of the Nativity. “I think Sellars’s idea of a social allegory of outsiders is very valid,” observes Redden, “but we decided on an entirely different approach.” He invited the British stage director John La Bouchardière to develop a full-scale staging for the Memminger Auditorium. Ever since El Niño’s initial unveiling in a theatrically staged context, performances have tended to go in the direction of straightforward concert presentations in the manner of an oratorio — looking back to the role of Handel’s Messiah as an important model for Adams’s conception. This new production by Spoleto Festival USA therefore represents a significant new chapter in the reception history of a major contemporary masterpiece. May 21, 2014 • 1:47 pm Comments Off on A Van Gogh Acquisition in D.C.
A Van Gogh Acquisition in D.C. Hanging in the same gallery as five other late-period van Goghs — Girl in White (1890) (also from Auvers) La Mousmé (1888), The Olive Orchard (1889), Roses (1890), and Self-Portrait (1889) — the new acquisition invites the viewer to make some very interesting comparisons. Both the sense of a mystical energy animating the landscape and the drive toward abstraction seem to me the most striking features here. 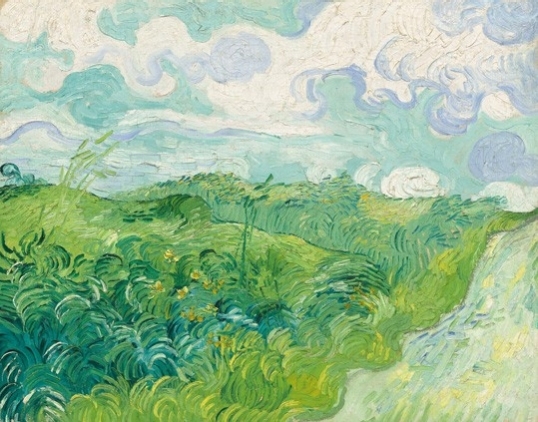 Green Wheat Fields, Auvers came into the possession of the artist’s brother Theo and was sold to a Berlin collector in 1906, who later sold it to the great National Gallery benefactor Paul Mellon in 1955. Mellon’s widow, Rachel Lambert Mellon, was given rights of possession of this painting for her lifetime but chose to relinquish it to the National Gallery. What must it feel like to have such an intriguing masterpiece in your home (in Upperville, Virginia, for Mrs. Mellon), day after day? How does one make the decision to then “relinquish” it for the public good? Because there is so little to read in the composition, the focus is on the color but even more so on brushwork — the clouds whipping around in spinning circles, opening out and closing in, van Gogh’s brush squiggling across the surface in long calligraphic strokes. The paint is applied in thick impasto, creating the marvelous textured surface of van Gogh’s best loved paintings. Through his dynamic touch and vivid, unmediated color, van Gogh expresses the intense freshness of this slice of countryside. I was delighted to be able to catch the last of the three New Moves programs at the Kennedy Center Concert Hall. The series involved an innovative collaboration between the National Symphony Orchestra — playing music by American composers, each program featuring works by living artists — and various dance companies. Both the Sinfonia No. 4 by George Walker, on the first half, and the Adams were the obvious highlights, in my opinion. Michael Daugherty’s Red Cape Tango seemed especially weak and awkward in this company (better suited for a pops concert), while conductor Thomas Wilkins led an auto-pilot reading of Copland’s Appalachian Spring Suite. Several audience members in the post-concert QA wondered whether the violin soloist Leila Josefowicz hadn’t felt upstaged, facing competition, with the dancers carrying on throughout the length of this complex, expansive score. Leila said she was grateful to experience this new dimension of a work she’s played so many times now and in fact envied the audience’s perspective of being able to take in the entirety of the interaction. Both she and Jessica Lang were beautifully attuned to the Concerto’s many emotional layers. Lang decided at the last minute to make use of the chorister loft space for the opening movement, bringing her dancers down to an extended stage lip in front of the orchestra during the haunting second-movement Chaconne (“Body through which the dream flows”) and cranking up the physical energy to a breathless level to match the music of Adams’s “Toccare.” Especially effective, I thought, was Lang’s focus on abstract interaction with the music, with just a suggestive minimum of narrative clues for the audience to tease out if and as they wished. Kudos to the NSO and director of artistic planning Nigel Boon for putting together this programming innovation. I hope this won’t end up being a one-off but will inspire similar efforts by the NSO and other institutions. Music lovers in the Seattle area will not want to miss this weekend’s performances of Semele, a joint effort by Pacific MusicWorks and the University of Washington School of Music. I was lucky to be able to attend one of the rehearsals, where I found myself spellbound by the flow of ideas and inspired rapport between director James Darrah and the cast — all this without a stage or costumes and only harpsichord accompaniment. Semele is a late Handel work (1743) that never fit comfortably into the era’s expectations for either opera or oratorio, but Darrah and company are treating it as the liveliest brand of music theater, full of humor, wit, enchantment, and (literally and figuratively) epiphany. It’s easy enough to imagine the musical and theatrical potential Handel saw in this material, retooling a libretto more than 30 years old — it includes the work of Alexander Pope — which itself retells the classical myth of Semele and Zeus/Jupiter. The human Semele has a fateful love affair with none other than the king of the gods, triggering the jealousy of his wife. Juno’s plan to avenge herself results in the destruction of Semele as a mortal woman but leads to the birth of Dionysus/Bacchus — a boon for humanity. Seattle has tended to be a Handel-deprived zone for far too long, but Stephen Stubbs — the visionary artistic director of Pacific MusicWorks — is changing the playing field with his musically and theatrically stimulating advocacy of early and baroque composers. An internationally acclaimed musical director and lutenist, Stubbs marries the energies of his early music expertise with an appreciation of cutting-edge stage direction and interdisciplinary artistic creativity. During the rehearsal I saw, Darrah was coaching the appealing cast of young artists singing the chorus into how to develop into a major character in their own right rather than a passive, fly-on-the-wall musical presence. The chorus became a visible and dynamic extension of the power play among Semele, Juno, and Jupiter. And far from purveying an arbitrary “concept,” Darrah showed with his sensitivity to the subtexts of Handel’s melody and counterpoint that he commands an intimate understanding of the score and of the way Handel constructs his narrative arc. It should be fascinating to compare the final results of performance with what will happen on the Seattle Opera stage next February-March, when the director Tomer Zvulun returns for a mainstage production of Semele. Meanwhile, Stubbs is spearheading experiments in smaller-scale productions involving partnerships between different organizations and even with companies across the Northwest — all of which promises to enliven the ecology of Seattle’s art scene, for early music and contemporary composers alike. 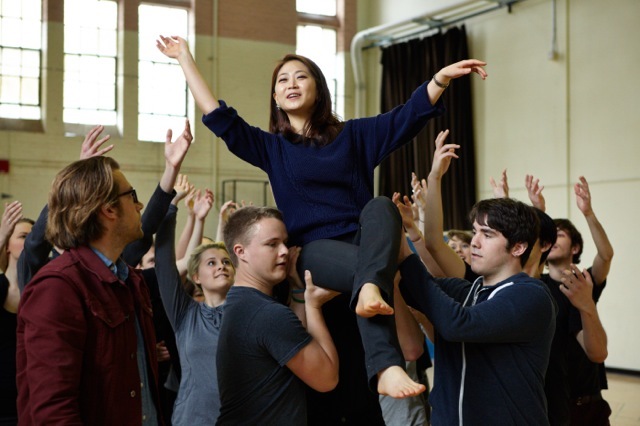 If you go: Pacific MusicWorks and the University of Washington School of Music present Handel’s Semele Friday and Saturday, May 16 and 17, at 7:30 pm and Sunday, May 18, at 2:00 pm at UW’s Meany Hall. (Sunday’s matinee performance is presented by the student cover cast.) Tickets at 206.543.4880 or 1.800.859.5342 or here. (c) 2014 Thomas May All rights reserved. Larry Brownlee just wrapped up the Met’s season with the final “Puritani” performance over the weekend and will be giving a recital Tuesday 13 May sponsored by Vocal Arts D.C.